This weekend is Memorial Day weekend, and here in New York City it’s a point in the year that always seems to me to be a time of transition. I think I get this impression because, quite amazingly, this weekend like clockwork normally brings us our first taste of summer heat. Saturday the temperature reached 76°, Sunday it reached 83°, and today reached 89°. The change in seasons in NYC can be quite abrupt. I was wearing long underwear a few weeks ago, and today I’m writing this article in shorts and a tank top. I do love the variety of seasons that we get to experience here! A time of transition can be a good moment to pause and assess any number of different things. 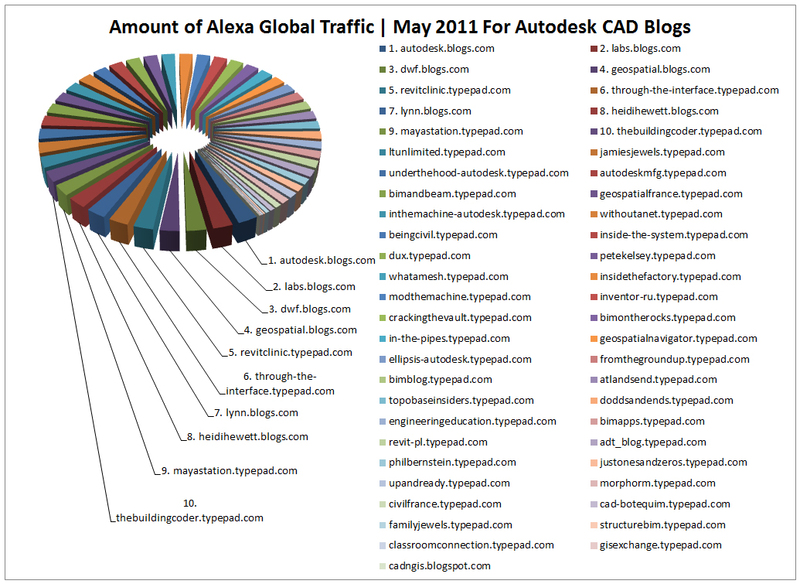 It’s kind of fitting then, to review the traffic data for the CAD blogs within the blogosphere, and then create a Top Ten CAD Blogs As Of May 2011 list, from that data. 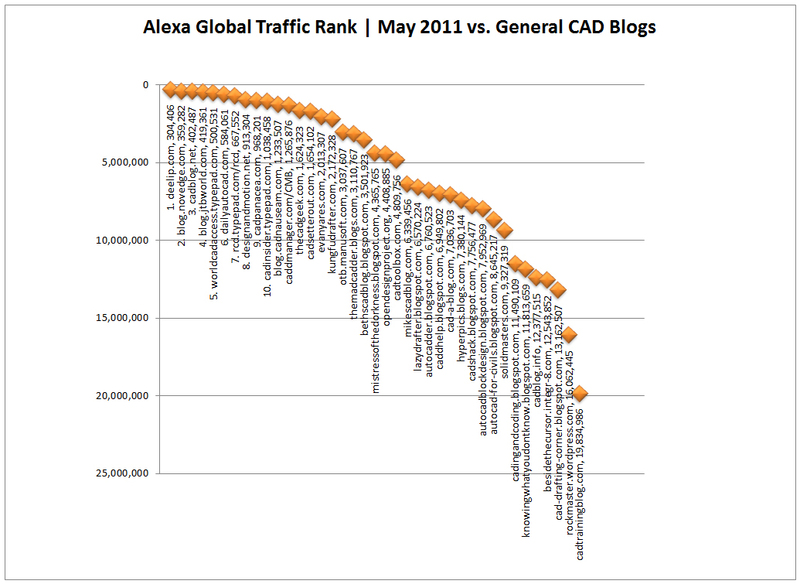 I’ll parse through the myriad of CAD blogs and rank them according to traffic, by using www.alexa.com‘s Global Traffic Rank. 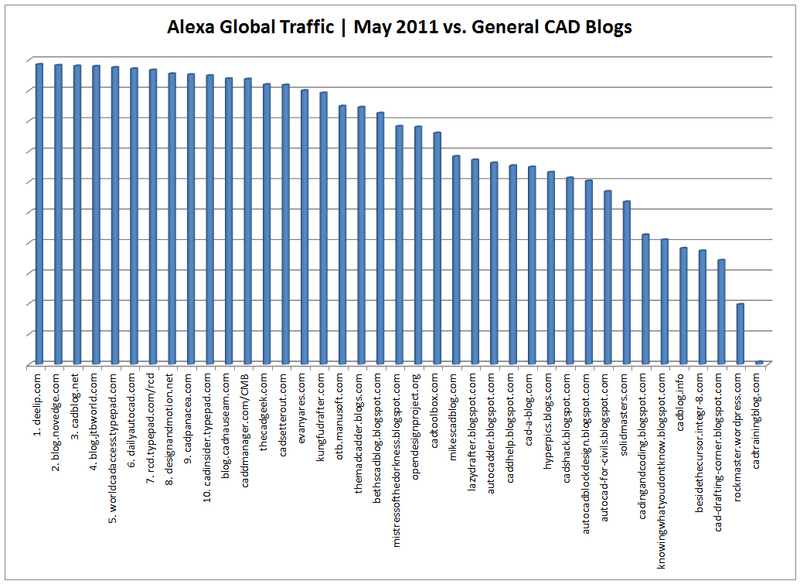 Alexa explains that their traffic rank is a measure of a site’s popularity. The rank is calculated using a combination of average daily visitors and pagviews over the past 3 months. The site with the highest combination of visitors and pageviews is ranked #1. In other words, Alexa’s #1 rank is the best-ranked site and # several million being NOT the best-ranked site. I know Alexa keeps records for at least 30,000,000 sites on the WWW. As I already mentioned, there exists a ton of different CAD blogs, so I’ll narrow the scope of this post down to covering two categories of CAD blogs. Those will be, Autodesk CAD blogs and non-Autodesk CAD blogs that are general in nature and/or primarily cover standard AutoCAD. In the future I’d like to do another post on non-Autodesk CAD blogs that cover specific software. For example, inventor blogs, civil 3D blogs, and etc. Therefore, if you have ideas for software or niche specific CAD blogs, then please let me know about them. Were websites that were structured primarily as a blog. Lastly, if I’ve missed your website, then my apologies! I plan on compiling this list again on or about the one year anniversary of this post, so please let me know about your site and I’ll include it the next time around. 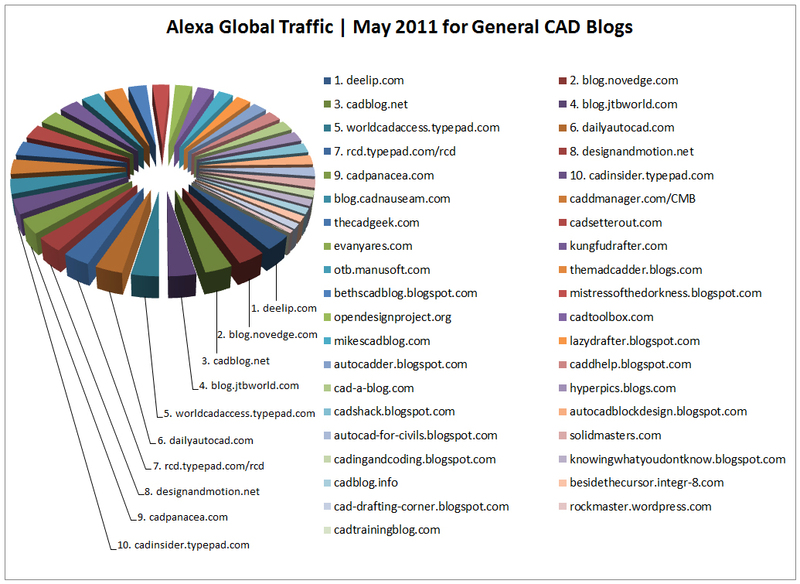 The big winner in the General CAD Blogs category was Deelip Menezes’ blog www.deelip.com (see image below). 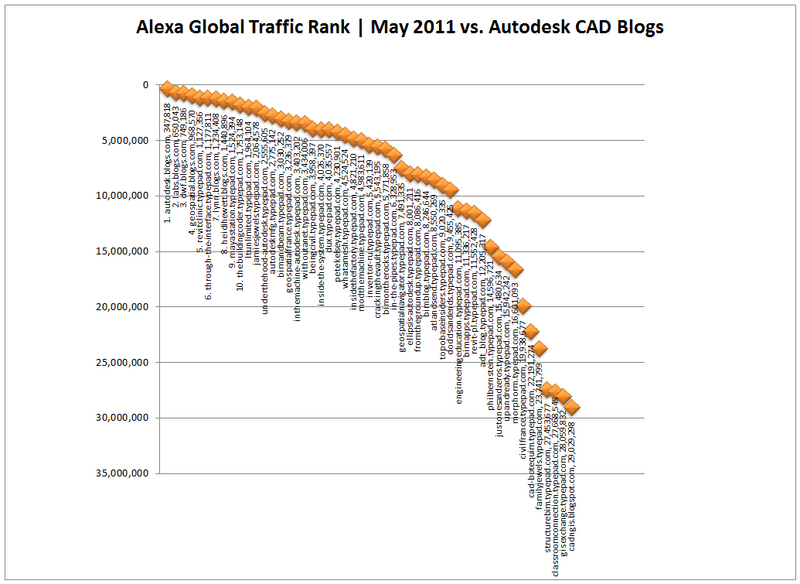 The big winner in the Autodesk CAD blog category was Shaan Hurley’s blog http://autodesk.blogs.com/ (see image below). So there you have it! 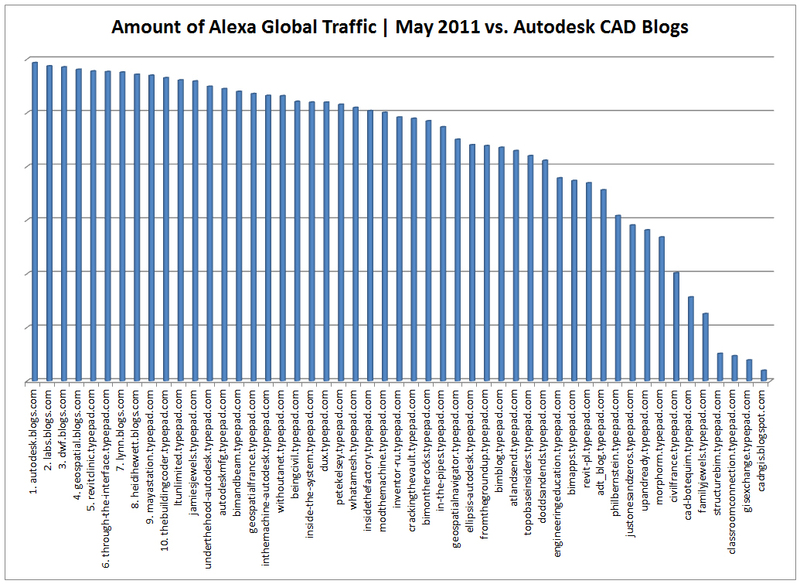 The Top Ten CAD Blogs As Of May 2011, for the General and Autodesk categories, along with the Mixed results. p.s. This post is the kick-off article of my brand new blog here on draftingservices.com. I hope you enjoyed it, and I welcome you back anytime! Thanks for doing the analysis and sharing the results. We do what we can to get the word out regarding Autodesk research, technology previews, betas, applications, and service packs. Blogs are an expedient and fun way to do that. Nice to see private blogs doing better than the ones sponsored by billion-dollar corporations! Thank you Edwin. I took a quick peek at your website, and it seems that it is the type of blog that I was looking to include. – Sorry I missed it, and I’ll get it next time! Thanks for the mention, I suspect my blog is flattered a little by Alexia reporting on the domain rather than just cad specific blog URL but nice to see people are reading! Like your work and thanks for your time have spend. I am surprised for my ranked blog I didn’t think so. Thanks Brian, I think we all appreciate the exposure, and it’s kind of cool to see the charting. Great work.